I am posting this just after I returned from a failed trip. It didn't fail for lack of trains, or clouds, or cops, or other fans in the shot. It failed because I am stupid and impatient. Oh, there are other things too I am sure. These are just some of the sins I committed in less than an hour tonight. Oh well, better luck next time and thanks for listening. 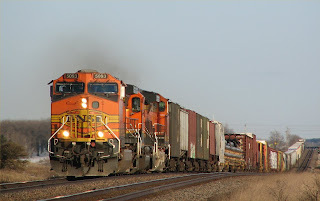 On my way home from DL today I chased a stack train from near Frazee east to Perham. 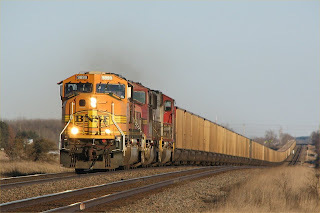 When I rejoined the tracks east of Perham I was a couple of train lengths ahead and gaining. I have wanted to try this shot for a while and since the sun was not right for any shots of an eastbound thought I would give it a try. Result: Not a thrilling success but you have to experiment. This is just west of the current overpass where Highway 10 crosses above the tracks. Apparently back in "the day" the tracks went over the highway. Who knew? Yes, that is my white work car, and no, I didn't realize it would such an eyesore in the photo when I shot it. Live and learn. OK, I've got this fancy new camera. I have the good fortune to live in a "target rich environment" when it comes to railroad photography. It's summertime, and the shooting is good, with a nice high pressure system and cloud free skies. I can stand at a grade crossing and pick off trains one after another. So what's the problem? After a while they start to look the same. There is no creativity, no adventure, no freedom. It almost becomes like a job, going out and catching trains at your favorite crossing or curve or dip in the tracks. 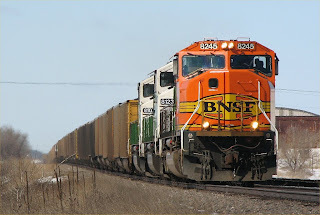 The only unkown left is which loco the BNSF will decide to strap onto the front of the train. And so you start to search. What can I do, here in good old central Minnesota, to vary the shot? Moving to Colorado is not a feasible option. You drive down the highway looking for something different. Is there an original shot to be had here? Or there? Or somewhere else? 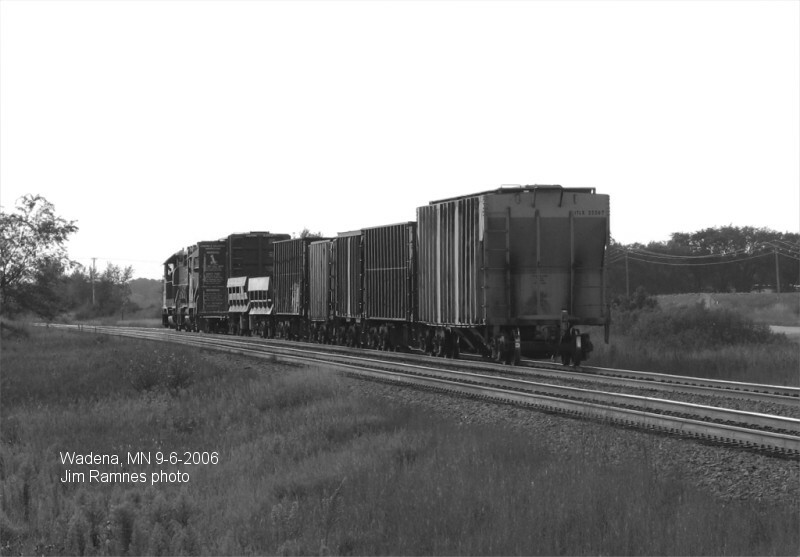 On August 5th I ventured away from the grade crossings west of Wadena. It was time to bust through some of the 6' tall sweetclover and the bull thistles as thick as your wrist. While you are less than 100' off the highway, it seems like a world away. 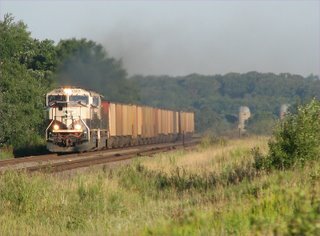 The first target that presented itself was this SD70MAC. This was definitely an improvement! Instead of trying to angle the shot to get the entire train in the picture, or as much as possible, here is an interesting picture. So what is good about this picture? Well, first of all, the MAC in executive paint is my favorite locomotive. The filth on this engine says heavy haul railroad to me. I like the way the curve presents the head end of the train to the camera, and variety in the cars of the train add interest. One downside of the photo for me was the lack of the original BN logo on the nose of the loco. 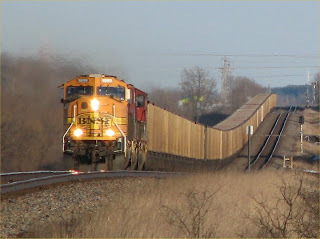 Just west of Wadena, the BNSF main heads down into the Leaf River Valley and there is a gentle curve. I had shot numerous eastbounds just entering this curve mornings. However, on the east end of the curve the tracks are hidden by a tree row on the north and there is a wooded area on the south. I had glanced at this area in the past but could not see any real possibilites there from the road. On this morning, though, I decided to venture off road and take a look. My intention was to shoot the 9547 once again coming up the grade, and I succeeded in that, but looking west I saw a view that seemed attractive and decided to wait and see what developed. After a wait of less than half an hour I heard another eastbound blowing for the grade crossings near Bluffton and got ready to shoot him as he rounded the curve. It seems stange now but I never noticed the scenery elements until I got home later that morning and uploaded my shots. After a little cropping I found I had shot this: And this time I even got the old style BN logo on the nose! What really caught my eye, though, were the two silos and barn on the right side of the picture. 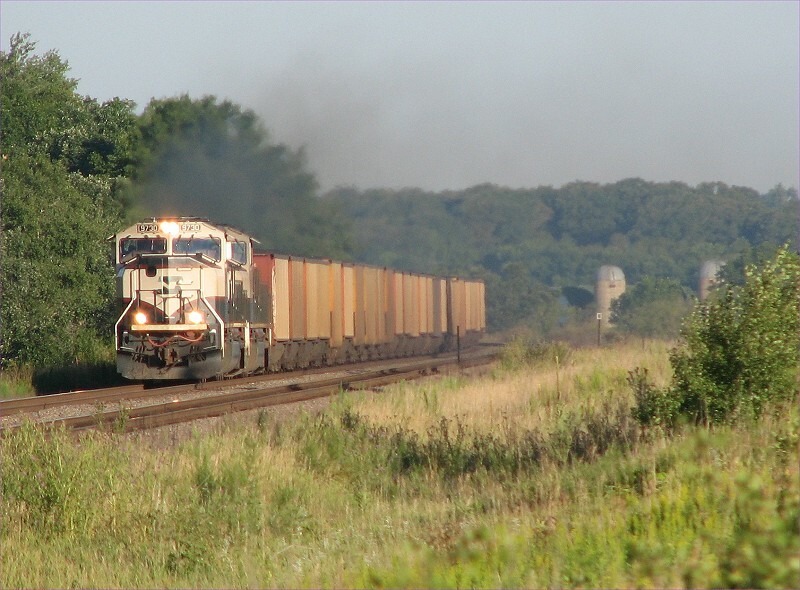 I also liked the way the MACS were working hard coming up the grade with coal loads in tow-the smoke and heat factor. 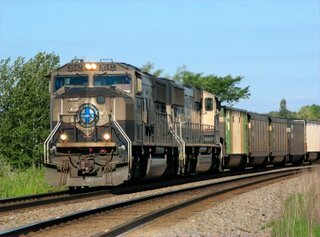 Finally, something more than a picture of a train at a grade crossing. The intruiging thing about this photo to me is that 4 lane US Highway 10 is between the tracks and the farmstead on this picture. However, the elevations and angles work together to make it appear this little farm is set close to the tracks and the railroad is passing though bucolic farm country rather than paralleling a 65 mph highway. And yes, you can be sure that I have been back to that spot again and will return in the future. Now I am constantly on the lookout for other locations where pictures would be able to convey a different message than a map. These areas are few and far between in the Wadena area. I hope to find more as I venture further afield. I have high hopes for the Lake Park region and for the area north of Lincoln east of here. For me, the point to all this is that there is more to the shot than just the train. I need to pay attention to the weather, the scenery, the season, the time of day, etc... if I hope to take pictures that I will want to share on a continuing basis. I certainly won't stop shooting everything I can and I will have some crossing shots that are worth sharing, but I think you need to dig deeper to produce real "good photos", shots to be proud of. All of this is personal. I am sure that there are folks out there who enjoy making technically great pictures of trains in conventional spots, and I don't mean to criticize that. I admire it. But for me, the search for something new, a different view of things, is half the fun of this hobby. East of Bluffton, MN-July 15, 2006-With a new found determination and a budding idea of how to accomplish what I was trying to do, I rose early on Saturday morning and ventured west with a plan more detailed than "Find a train and take a picture". I knew of a curve between Wadena and Bluffton that should present eastbounds in nice light early in the morning. Of course I had no way to know what was coming or when it would show up but I figured if I kept the windows open while parked at the crossing I would be able to hear horns a couple of crossings away and have plenty of time to be ready for whatever came. I had probably waited for no more than 5 minutes before I heard a horn in the west which immediately got my attention. Here was my big chance to take a good picture, maybe even something I would proud to share with the world via the internet. I established my postition, popped the lens cap, and switched on the camera. The next few moments seemed like hours as I waited to see what would come into view as I tried to calm my nerves and decide how much zoom I would use for this shot. Within a minute I saw a headlite in the west but was not able to identify the locomotive. 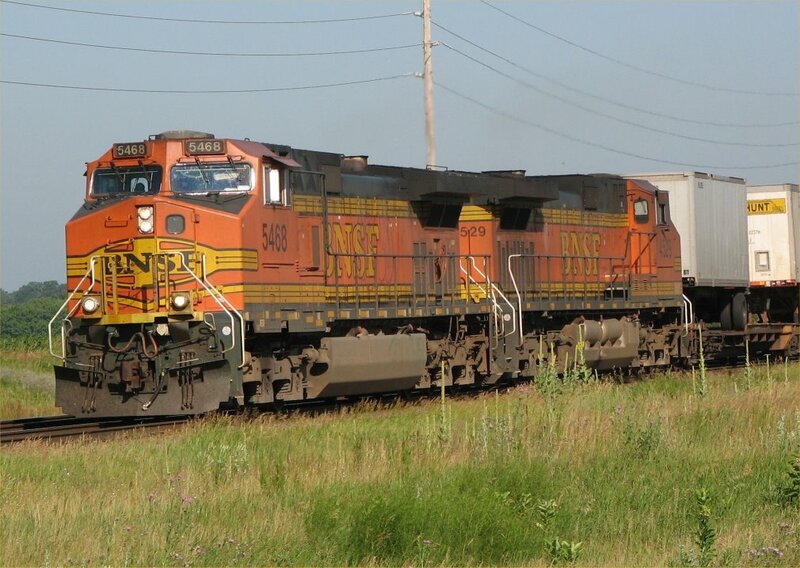 I zoomed in as far as I was able and thought it was funny looking locomotive. 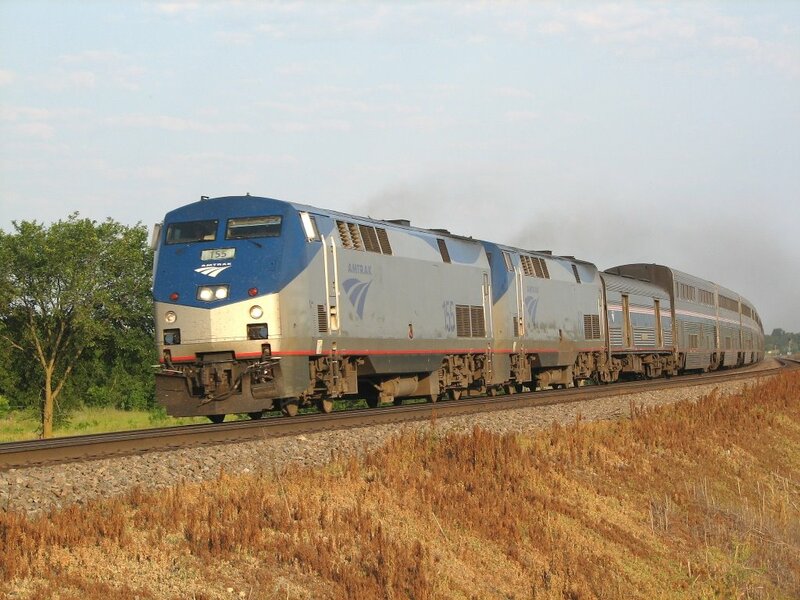 As it came nearer, I realized that unbelievably the first train I was going to shoot with a plan was the eastbound Empire Builder, the Amtrak passenger train that was scheduled to pass through Wadena at about 3:00 AM daily! 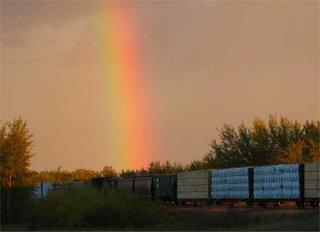 I had spotted this train in daylight only 2 or 3 times before during my 2 years in Wadena and now it filled the viewfinder of my camera. I was so startled I almost forgot to press the shutter button, but I finally remembered. The experience had a lot of similarities with sitting in a deer stand listening to the brush crackle as a critter approached. There was a definite adrenaline rush. I wanted to leave right away to go home and upload the image to look at it on screen but I convinced myself to hang around for a while to see what else showed. I caught another train a bit later led by GE C44's, and thought that was enough for the morning and headed home. I immediately cropped and sharpened and submitted these pictures and learned something else about the rp.net system-the waiting is that hardest part. Now that I had a picture I thought might really make the cut I was on pins and needles waiting for an answer on these shots. When I got the approval notice I was thrilled and viewed my own photos on the site multiple times that day. Lots of pride, and now there was a desire to take more pictures and get them accepted. I was about to become a telemasher. 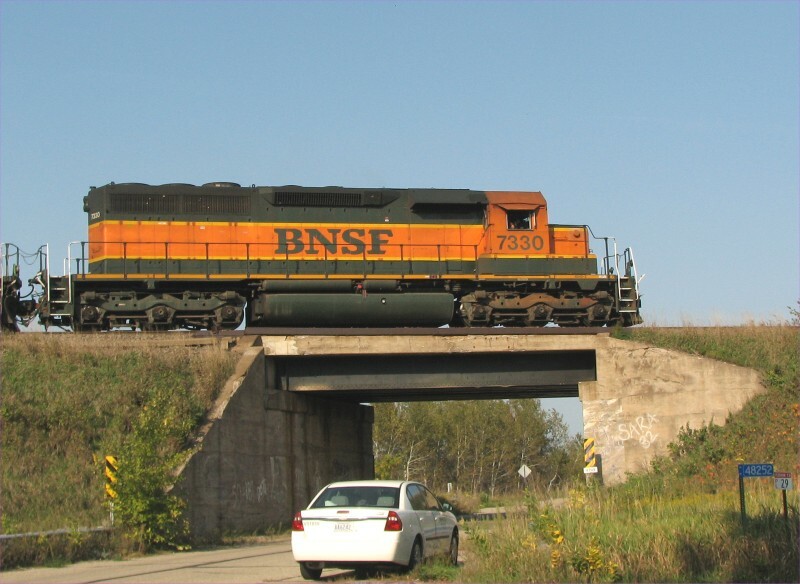 I have been a member of a number of internet mailing lists concerning railroads in the Upper Midwest for some years. 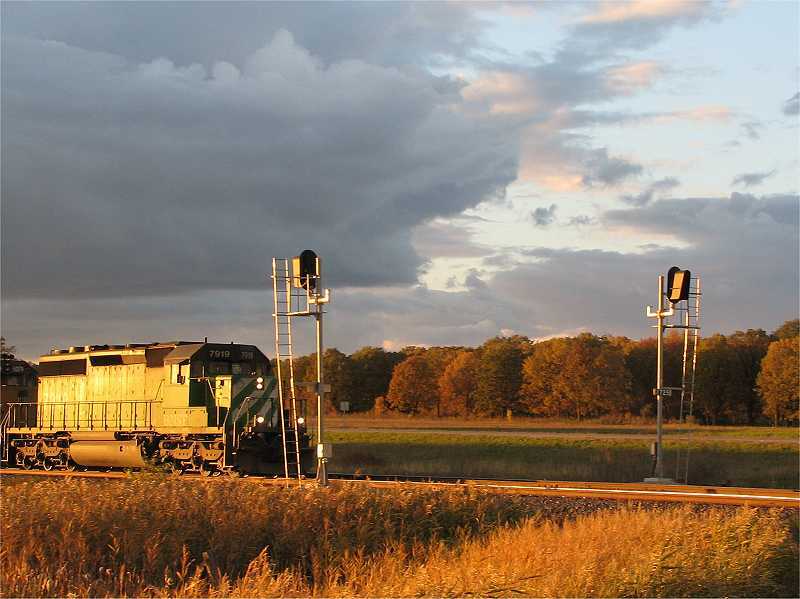 These included Twin Ports Rail, Orerail, MNRail, and most recently Northern Minnesota Rail. As a member of these lists I have admired the photography of other members and made some amateurish attempts at making photos of trains myself. 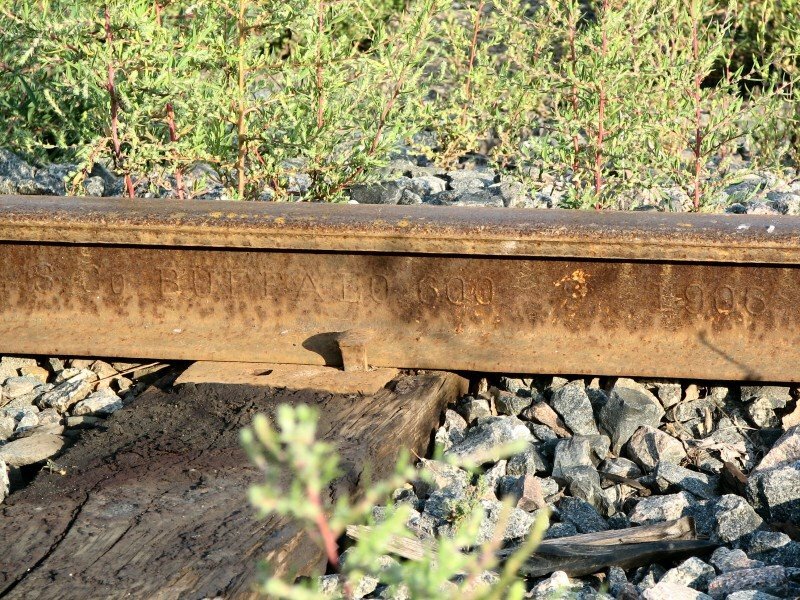 I have been lucky to live near faily busy tracks for at least 15 years while some of the contributers to these lists travel great distances to see what I see just in the course of my daily affairs. I have described what I've seen going on in occasional posts but never took photgraphy seriously enough to produce pictures I wanted to share unless they showed something very unusual or newsworthy. 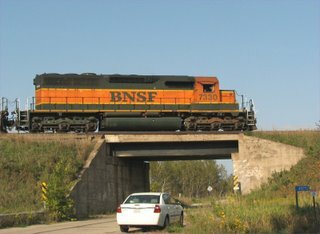 After my move to Wadena a couple of years ago and frequent travel along Highway 10, which parallels the Staples Sub of the BNSF in many areas, I came to the conclusion I should make the leap in technology that would allow me to shoot pictures that I could be proud of and willing to share on a day to day basis. After some questions and answers and time spent researching cameras on the internet, I came to the conclusion the a Canon S2IS would be the perfect tool for me to fulfill my desire to take good pictures. Dell was happy to provide the camera, and a orders to Newegg and Lensmate completed my outfit to start. I was off and running. 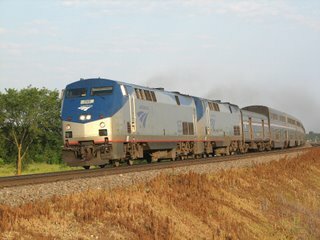 The gold standard of online rail photography, in my opinion, is railpictures.net. Of course with a fancy new camera and abundance of confidence and trains I was off to the races, submitting a few pictures the first day of my new hobby. All of them, including the photo at right, were promptly rejected by the screeners at rp.net, leaving me angry and frustrated. I know that my entrance into the forum there was not the most conducive to winning friends and influencing people. 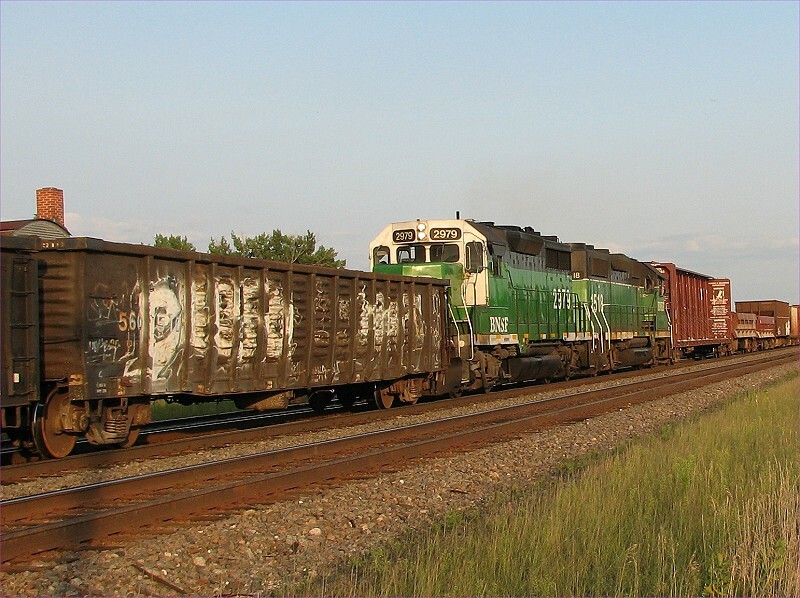 Since I had the new camera and the abundance of trains I figued that getting into the rp.net database would be a piece of cake. Overcoming these thoughts provided me with my first valuable lesson in photography-no matter your equipment, you still need to point the camera in correct direction,pay attention to the light, and frame your subject correctly in order to make a quality photo. How you process your photos after shooting them (the "digital darkroom") also matters a lot. It seems I got myself into something a lot more involved than just pointing and clicking! Next-a big surprise and success! Edited to fix broken lensmate link. 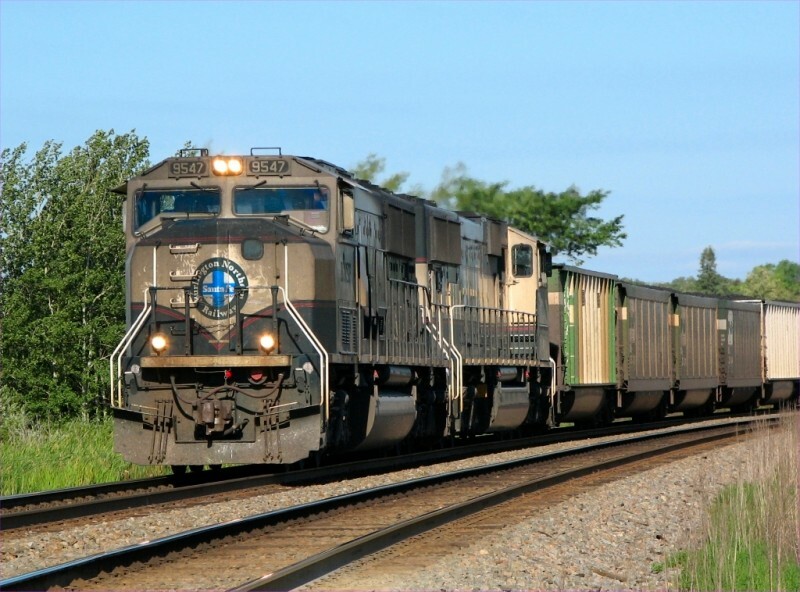 All my life I have been interested in trains and railroading. 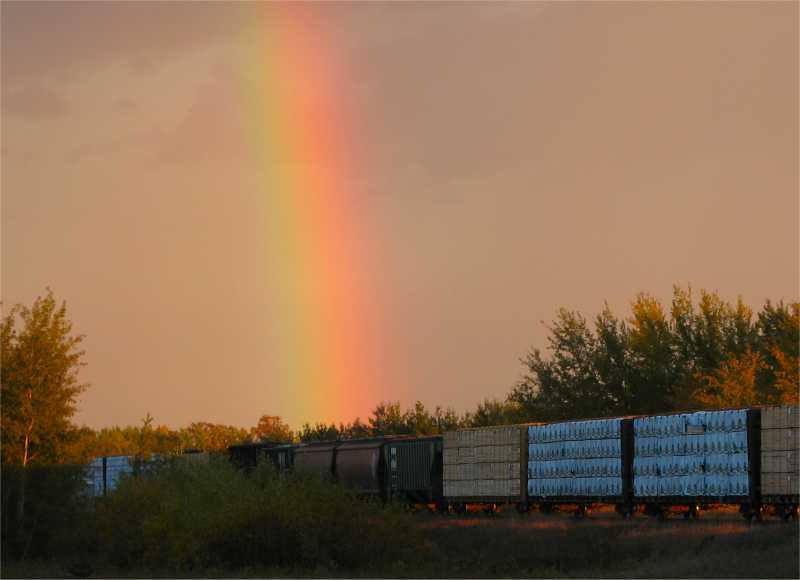 What is in all those boxcars and containers we see passing be every day? Where is it all headed? 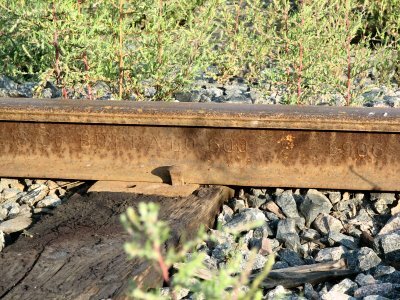 How can the railroad and employees make sure it gets where it is supposed to go? I don't have the answers to these questions. They do occupy my mind while I am sitting trackside, waiting for the next train and listening to the scanner. I created this blog to share some of the pictures I take and the stories behind them. Hopefully someone will find it interesting, if you do, let me know.